So I have two cars. One is the Jeep. The Jeep’s journey from Norman, Okla. to Cache Valley is chronicled under separate cover. Then there’s Car 2. My house in Utah was going to close on April 27th, but I still had to be in Oklahoma teaching until May 10th or so. Some point around the first of the year, I’d decided to make it a goal to spend as few weekends in Oklahoma as possible. So it occurred to me that, right after my house closed on the 27th, I should deliver Car 2 to its new home. Got on the road on Friday the 28th. Had plane tickets back from SLC-OKC for Sunday the 30th. Drove up 35 to 240 to 40 west. Everything was fine. Passed through Elk City: everything was fine. Decided I should buy gas at the next town, called “Sayre”, which seemed fine. Then, while doing 85 and passing a pickup truck, the pavement started feeling rough or something. 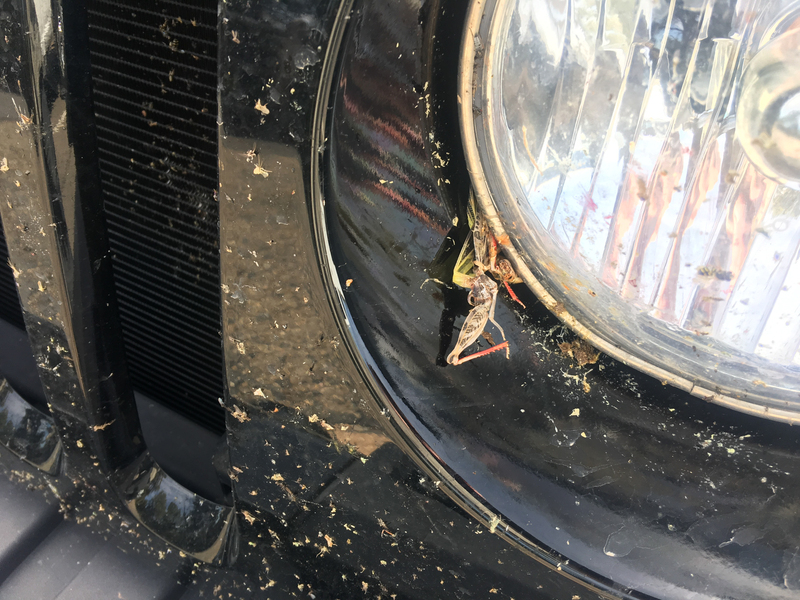 I finished the pass, but there definitely was a thing going on between my car and the road. Exit was 3/4 mile ahead. Pulled off, car handled weird. Went to the gas station that was not advertising Indian food. Bought gas. Looked at tires: sidewall blown out of the left-rear. 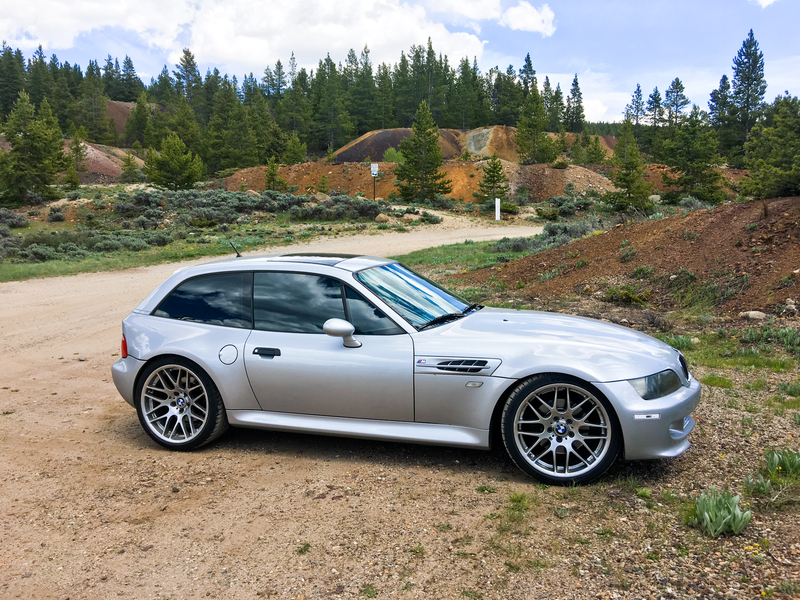 This car is a 2000 BMW M Coupe. It’s built to be a very uncompromising sports car. Uncompromising meaning, for instance, that in an attempt to lower the car’s weight and thereby improve performance, the designers decided against including a spare tire of any kind. Took it to the shop behind the gas station and was told they only look at semis. Drove back across the freeway to the Indian food truck stop. Apparently Indian food truck stops are really just Indian truck stops. Like from India. The garage at the Indian truck stop, though, was mostly run by a Mexican dude, who was very helpful, except that “uncompromising” also means having really wide, low-profile tires, the kind that totally don’t go on pickups. Meaning that neither the Indian truck stop nor anyone else in Sayre, Okla. carried that size. Called three places in Elk City, and one could get a set in on Tuesday. Called El Reno: nothing. At which point I realized I’d be spending another weekend in Oklahoma. Called my insurance company to see how much they’d pay toward a tow back to Norman. It was non-zero. 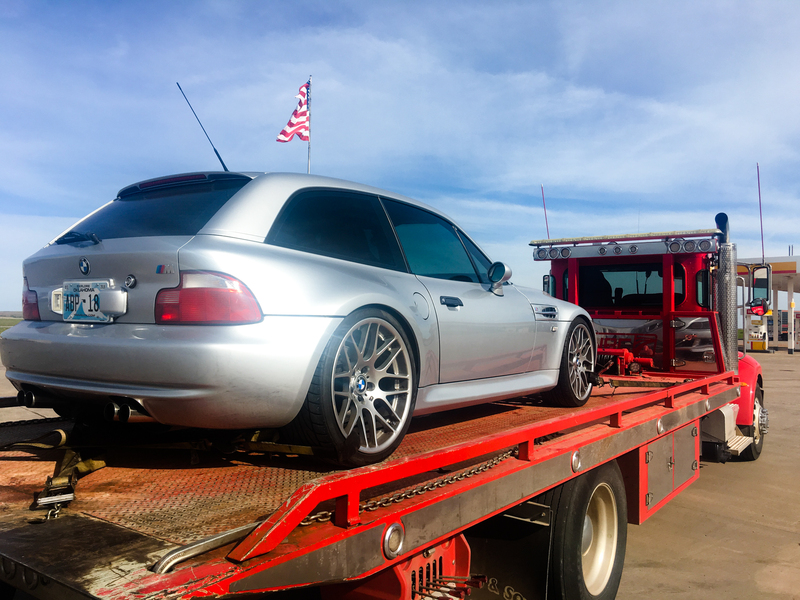 Got the one towing company in Elk City that could handle getting a way-low sports car on their flatbed to come out and give me a lift. And then was on my way back to Norman, Okla. The tow was 154 miles and cost me, after State Farm picked up the tab for the first nine miles, I think $397? Which honestly seems almost cheap. It wasn’t like the driver had a car waiting for him in Norman to bring back to Elk City or something. I don’t think a cab, without the tow, would have been less. Also, every time I’ve had a tow truck (once during the 48-state road trip for a good 60 miles from Olympia to Auburn, and a couple of short tows in Pittsburgh), the drivers have been pretty awesome. This guy and I had wide-ranging conversations about skiing, religion, renaissance fairs, social media, etc. I should break down more often I guess. Haines & Son Towing, Elk City, Okla. One more good thing for the list of good things in Oklahoma. Just FYI, when you have tires with very low profiles, blowing one out isn’t a violent event. It felt like any other flat tire I’d ever had. Which isn’t very many, but still, it wasn’t like the car collapsed onto its axel and then careened into a guardrail. One more thing. At the Indian truck stop garage, I met a married couple who were on their way from Arkansas to Reno, where an online casino had hired them and their six chickens whom they were towing in their 20-foot trailer. The chickens had been trained to play tic-tac-toe competitively. So that’s a thing that exists. Now on to other more things. Once that trip was scrubbed, I finished the semester, then moved everything but the Coupe to Utah. The stars didn’t align for me to go back and pick it up until middle of June. Used what value was left on the plane ticket from April I’d had to cancel, flew down to OKC, eventually got picked up by the shuttle I’d reserved (this wasn’t something for the good things in Oklahoma list), then was reunited with my Titanium Silver shooting brake. I tried to optimize this trip around finding “fun roads” for the Coupe to ply. First day made it all the way to Salida. It’s a cool town that I’d particularly liked when I visited it last winter. 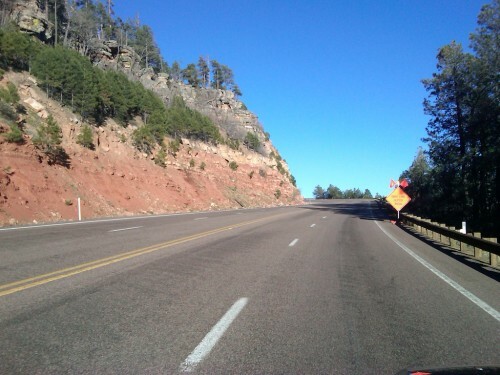 There aren’t any fun roads between Norman and New Mexico, but things started turning around near Raton and stayed at least pretty good from then on. 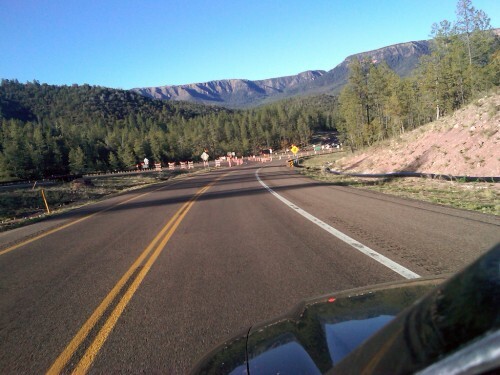 The stretch from the freeway out to Salida was particularly good. I saw a bear (black). Next day headed up the mountains to Leadville. When I drove through that area over the winter, it was a white-knuckle ride, especially for someone accustomed to driving the non-iced-over low-lands. More easy going in the summer. 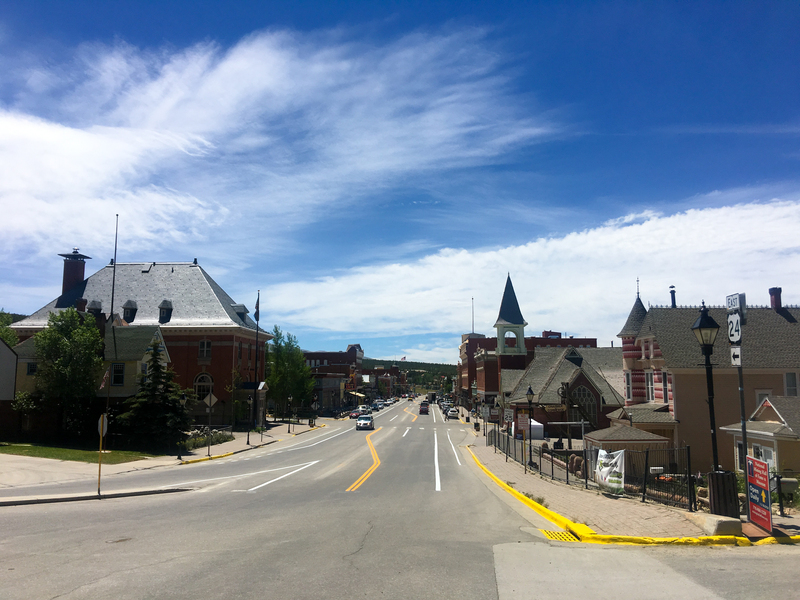 Leadville’s a cool town. I think I first heard of it when reading The Making of a Hardrock Miner, which is still one of my top five non-fiction books of all time. It’s a first-person account of a guy (Steve Voynick) who needed money and ended up finding himself working as a miner. 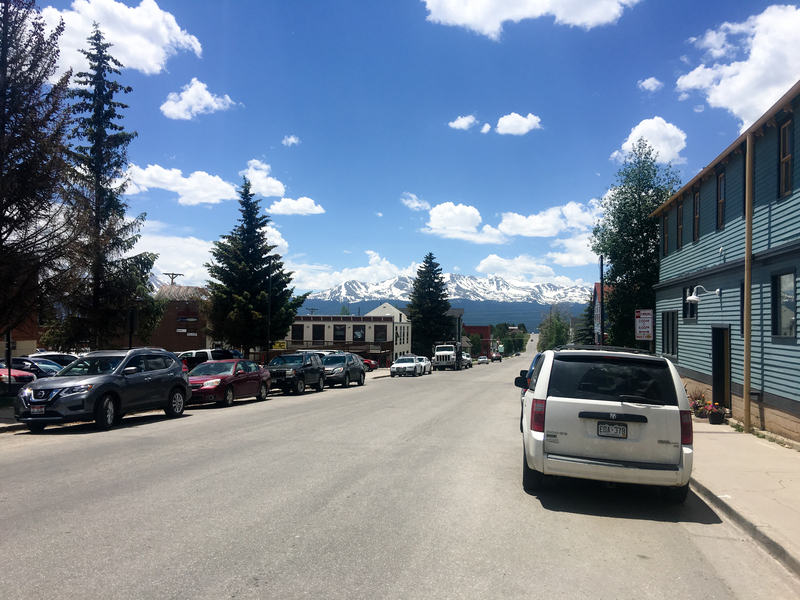 Leadville’s a place that’s really only about a half-hour south of Copper Mountain and Breckenridge and is located above 10,000′, which is pretty high. 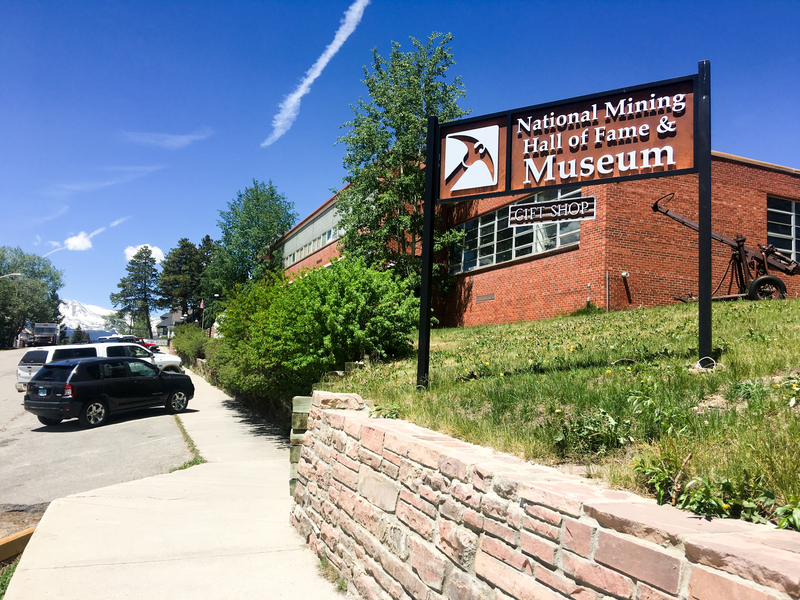 It’s a pretty little mining town that’s touristy enough to be interesting without having yet turned into Park City, Jackson, or Frisco. ^^ Town from the top of the main drag. So I went to this museum. 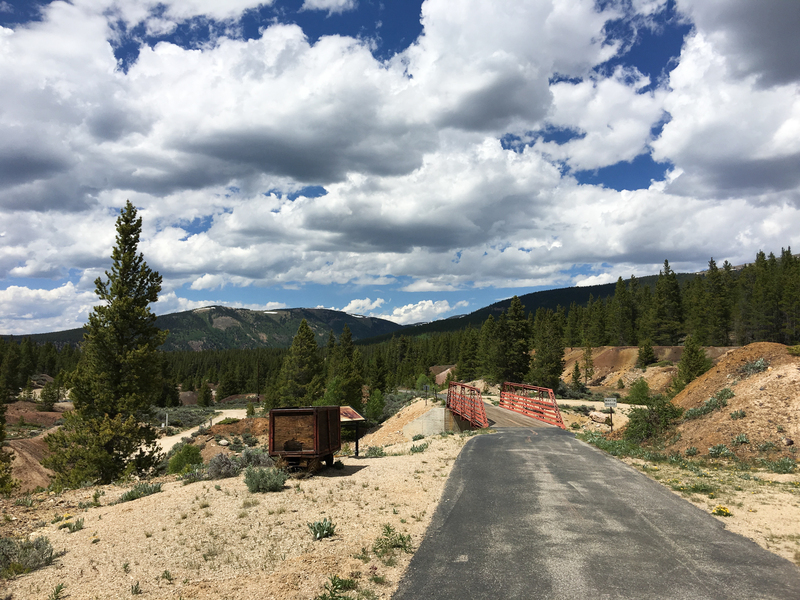 It’s fun, worthwhile, particularly if you’re in Leadville already. 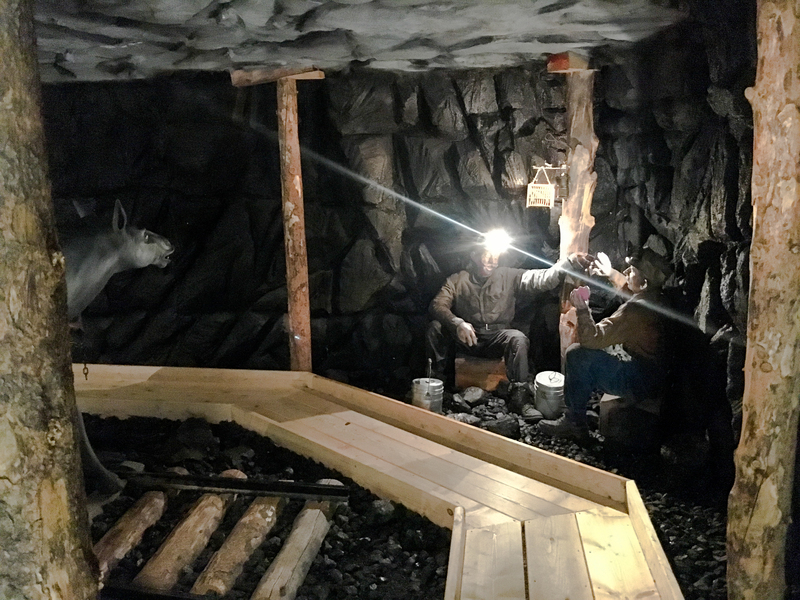 The Hall of Fame is a little tough to get excited about without being an industry insider, but they had some mine mock-ups to walk through that were fun, gave you a little bit of a sense that you were actually in a mine. So those were highlights of the museum. 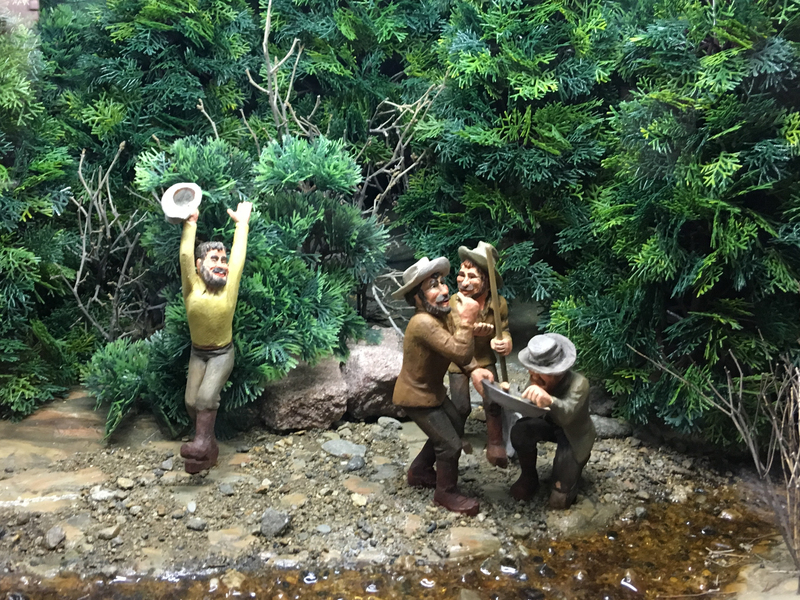 They also had some fun dioramas that explored important historical events in the development of the Colorado mining industry. I mean, look how happy they are! 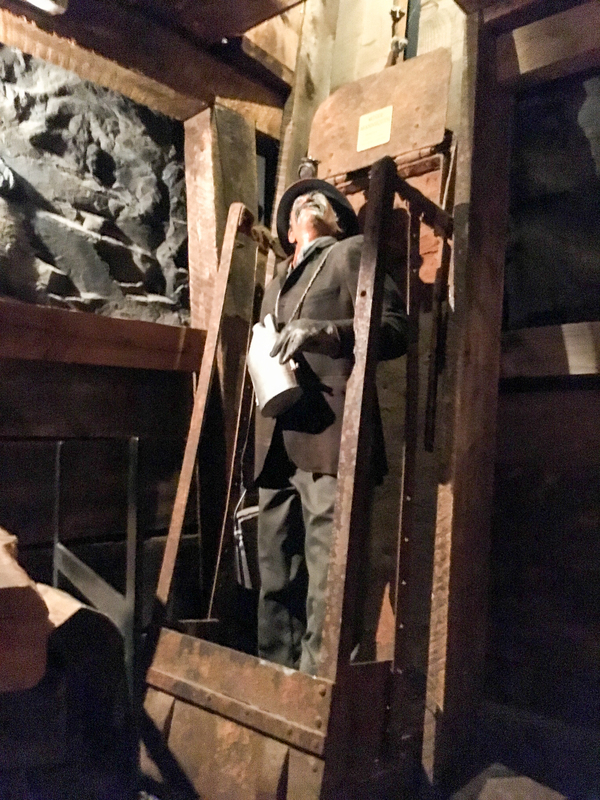 There’s also an associated mine tour. 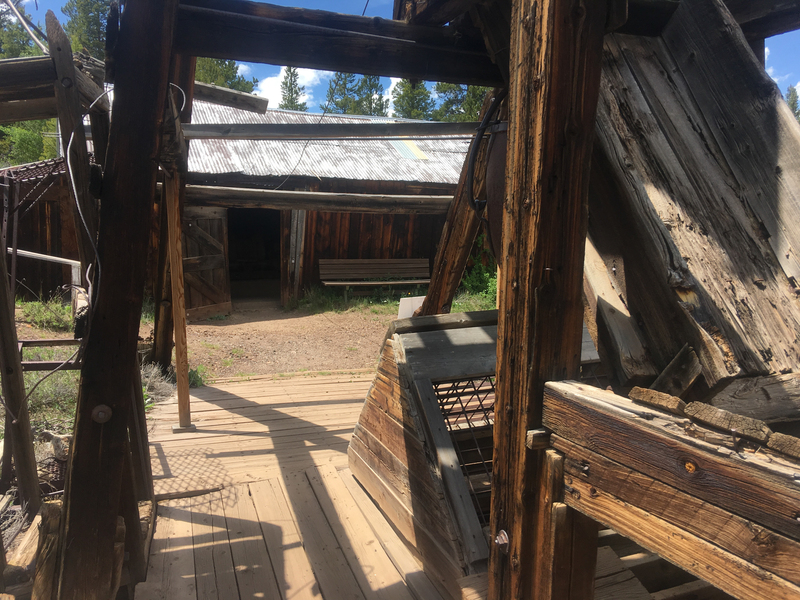 Although you don’t actually get to go into the mine, you get to see some of the century-old buildings around it. 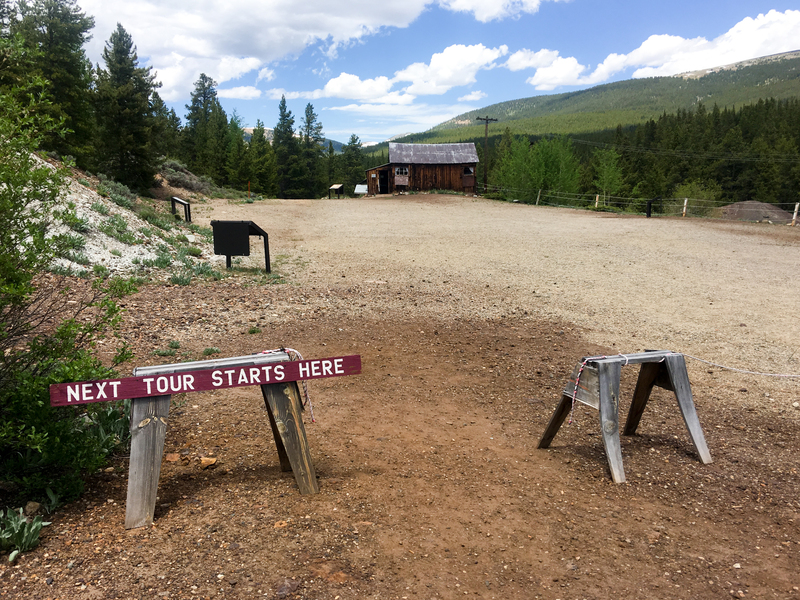 The tour guide was a former work colleague of Steve Voynick, which was also interesting to find out (the tour guide asked how I’d decided to come to Leadville). He said the book was pretty dead-on (it would’ve been surprising if that hadn’t been the case). Here’s a picture of my car parked at the mine tour. This way any time you think about my car, you won’t have to picture it on the back of a flatbed truck. And then I left. Stayed the night at a motel in Craig, Colo., where I was assigned to The Bear Room. 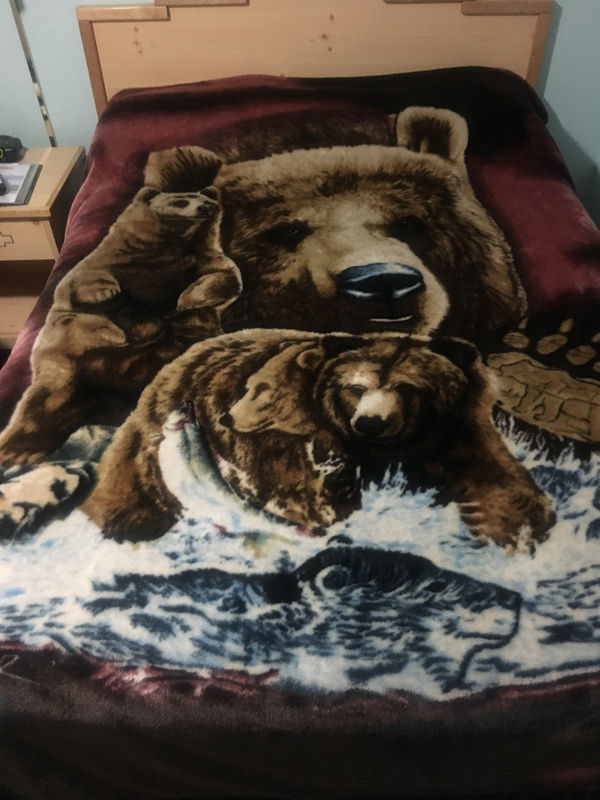 The bedspread was probably my favorite part, although everything else in the room was similarly bear-themed (the artwork, the phone, the floor mat, soap holder, shower curtain, towel bar, etc.). Impressive. And then it turned out that the funnest stretch of road on the whole trip was the stretch of US-89 through Logan Canyon. Let’s focus this post on the one car involved and the trip that brought it from Norman, Okla. home to River Heights. 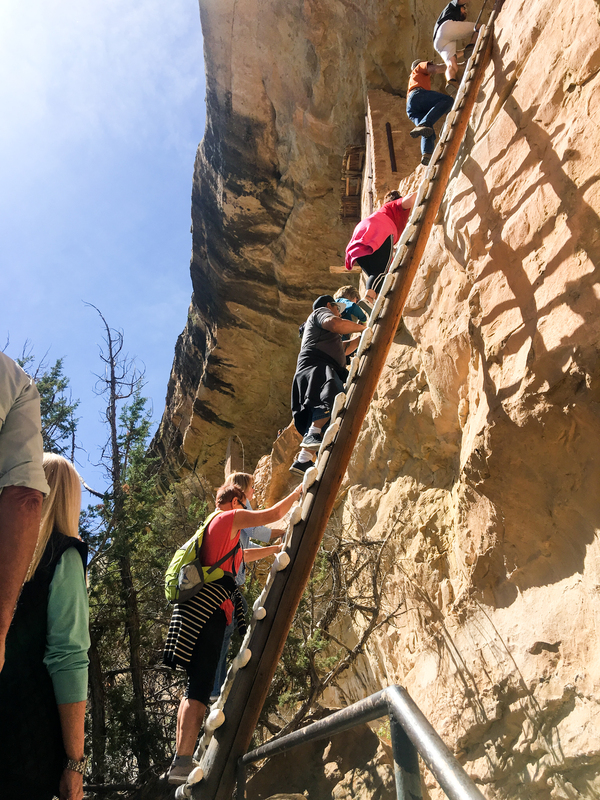 The goal on this trip was to also go by way of Mesa Verde National Park in an attempt to better amortize the cost of my national parks annual pass. Spent the first night in a motel in some benign part of Kansas. Let’s call it Pratt. 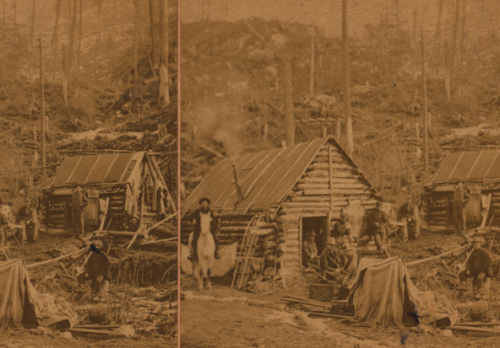 It could have been Medicine Lodge. It could’ve been Sawyer, but I’m gonna put my money on Pratt. This was the breakfast room that morning. 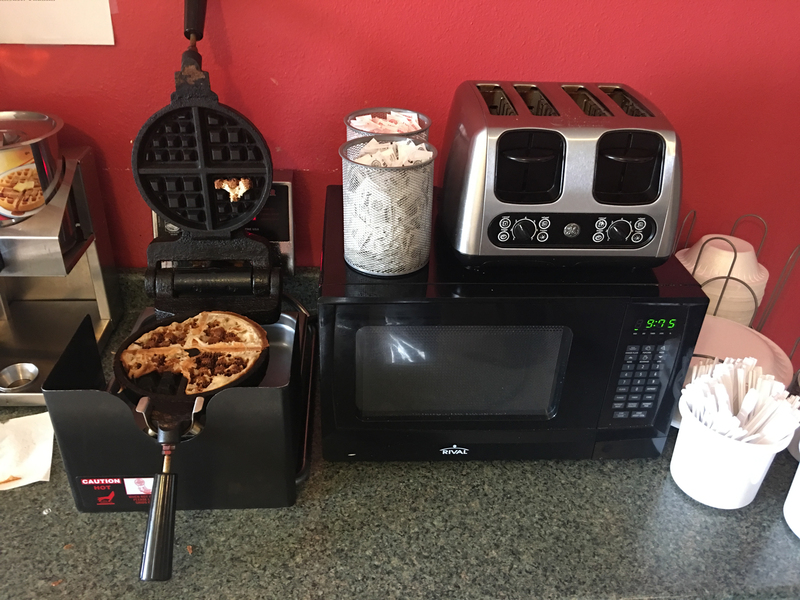 It’s difficult to say which was more disturbing, the waffle iron or the microwave giving the time using a metric-system clock. Next day, kept driving until I hit Cortez, Colo., at which point I quit driving, ate dinner at the same Mexican place that I’d visited with Jon, Erin, and Josh back in 1995, then checked into another motel, the drive-up kind where you park in front of your room. I wish all hotels on earth allowed you to just park in front of your room. 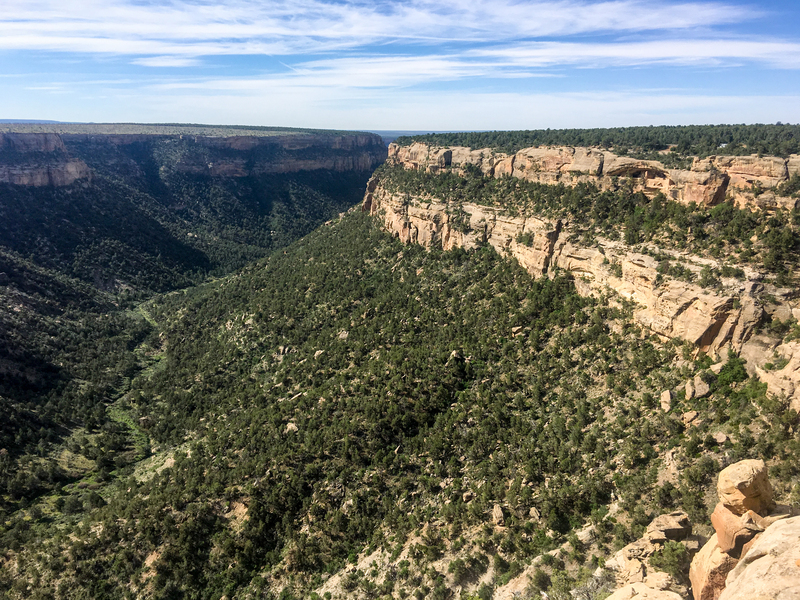 Next morning, headed up to Mesa Verde. It was more popular than last time I’d visited and you don’t get to self-guidedly tour the ruins any more. I signed up for the very guided tour to Cliff House instead. But first I parked somewhere and took this picture. You can see the Cliff House ruin there at the top rightish area. I mean, “see”. And then I and 50 of my closest friends got to tour Cliff House. At the start of the tour, the tour guide, Ranger Mark, informed us of all the dangers of our journey and suggested that we would all probably die of hydration some time in the next 20 minutes. Duly informed, we trudged down some steps then came to a tall ladder. I don’t like heights much. One person in the group opted out and went back the way we’d came. The ladder was fine except for having to hang there waiting for the slower, older people to move. Anyway. ^^ Ranger Mark explaining that no one knows what the ledge at the right of this photo was for. 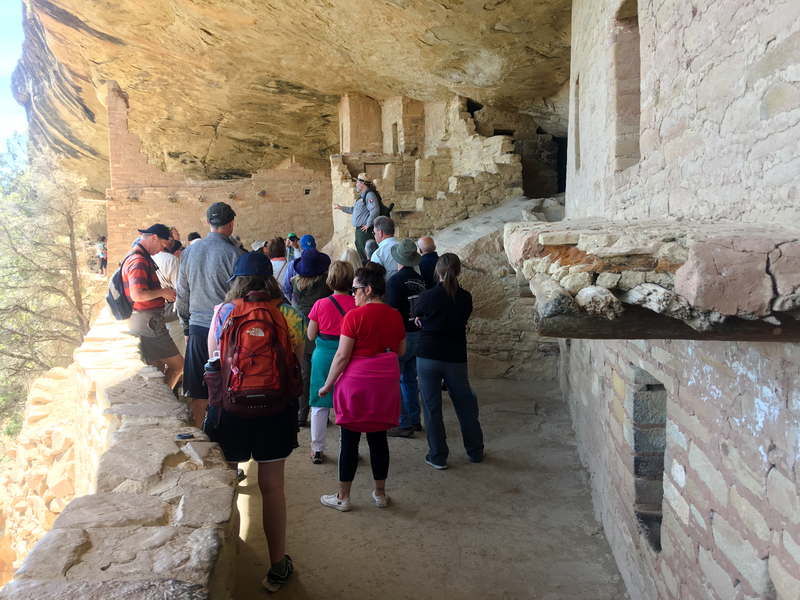 He was a good tour guide and lived in Tennessee eight months out of the year and only came out to Mesa Verde during the high season as a ranger. When not rangering, he delivers pizzas for a living. I imagine his wife works. And that was kind of most of it. 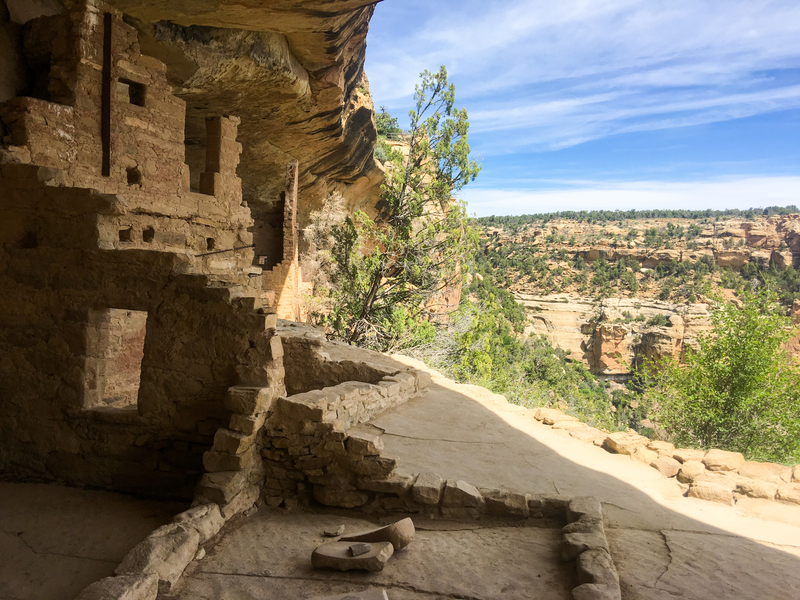 Had a brief discussion with Ranger Mark about the relative timelines between the Mesa Verde people and the Chaco Culture people. I don’t remember the outcome, though. I think Chaco Culture was older, but not by more than a couple generations. Or maybe I’m making that up. Anyway: the guy was pretty under-employed for eight months out of the year. There was some other scenic drive that I drove around there, during which I took this picture of some other ruin. Then I drove to the visitor’s center where two trails diverged. Fortunately there was a Native American park ranger standing there and we had this conversation. Me: Which one of these two hikes is better? Him: There’s no such thing as a “better” hike. I took neither, which also made a good-sized difference. My niece says that people like that are why she’s not interested in working for the Park Service. Hard to argue. 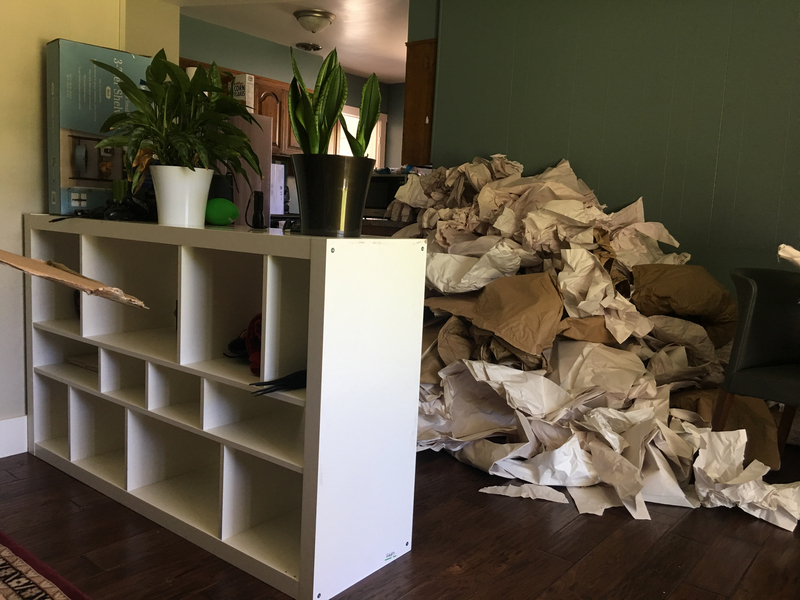 Then I drove to Price and stayed in another motel before heading on up to Cache Valley where, ten days later, the moving truck finally showed up to deliver all the packing paper that the company had decided to put into boxes a few days before I left. ^^ A fraction of the total. And that’s about that. 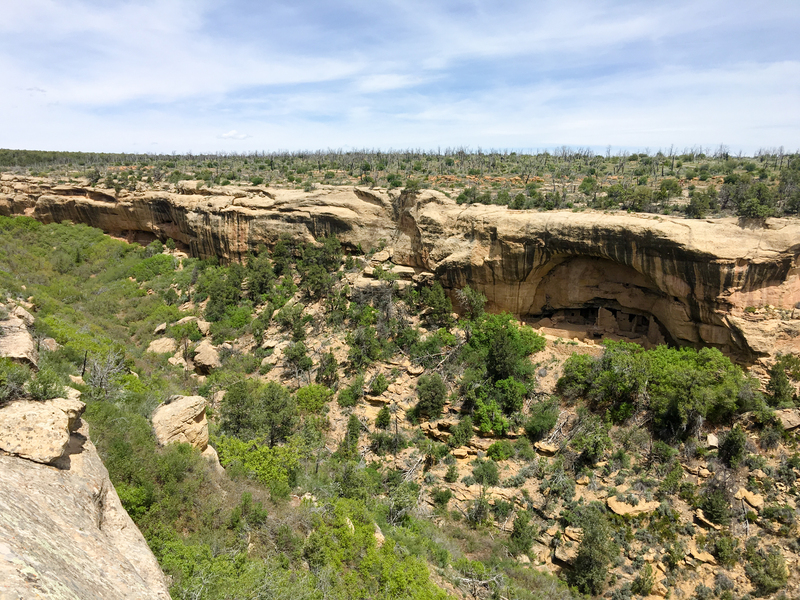 I really should’ve stopped off in southern Utah and re-visited Canyonlands and Arches, but was anxious to see the new house and find out what all was, in fact, broken. Time well spent. 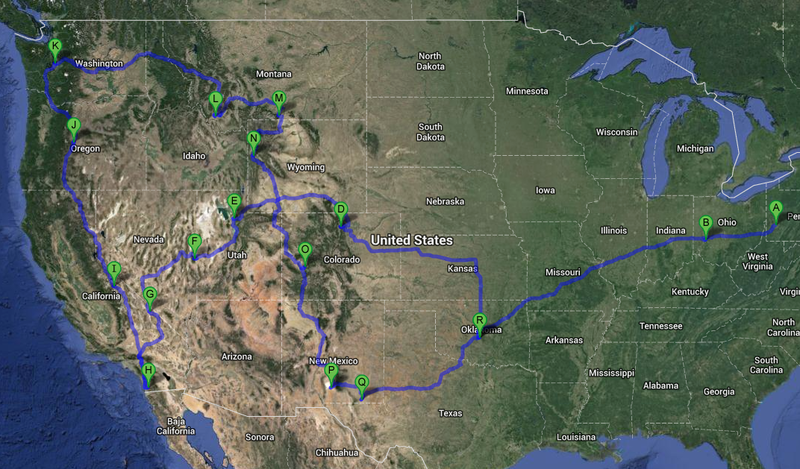 Although it’s also sort of a during-dissertation road trip. Not pictured is the flying from San Diego to Pittsburgh and back. Long may it remain unpictured! It was only 7 1/2 hours on Day 4. 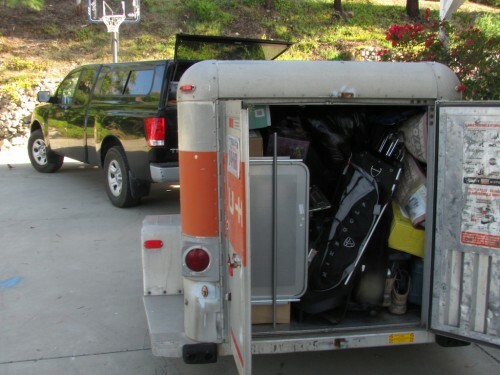 If I’d had running lights on the trailer, this really could have been a three-day trip — it was about 40 hours total. Ohio has nice rest stops. I mean almost shockingly nice. The Ohio River Valley (WVa in particular) is pretty. You can get really good hotel deals out at the airport via hotwire and priceline (Holiday Inn = $40/night). The house was here when I got here and mostly how I remembered it. Anti-climactic, I know. Here’s a photo of Pittsburgh from Carson Street. I didn’t make any compromises in Missouri. Unless just not stopping is considered a compromise. Come to think of it, I *did* come to a complete stop on the 270 (freeway north of St. Louis) a few times, but that was just because of traffic. And there was a ’94 Corolla that just about compromised the front end of my truck — that was also near St. Louis. Got out of Dodge (har!) around 7, bought gas in Olathe, Kan., then again in Greenville, Ill. Mileage is off a little bit (15 and 16), but still, I’m averaging 16 for the trip and if you had told me a week ago I’d be getting 16 mpg pulling a fully laden trailer, I’d have been, you know, pleasantly surprised. Although maybe not this particular photo so much. I think crossing Kansas is probably more interesting than crossing Nebraska. 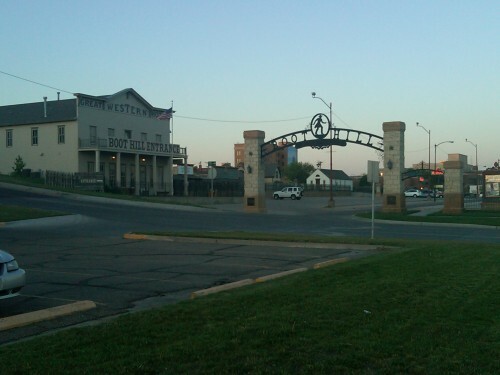 It’s a low-set bar, yes, but in Nebraska everything’s awful until you hit Lincoln. In Kansas, things start getting a little greener and hillier around Hutchinson, which beats Lincoln by over a full degree of longitude, ergo Kansas ftw. There seems to be a Pabst Blue Ribbon-drinkers convention going on at the Days Inn in Terre Haute tonight. Possibly also tomorrow, I’m not sure. Driving through Southern Illinois is more pleasant than driving through northern. 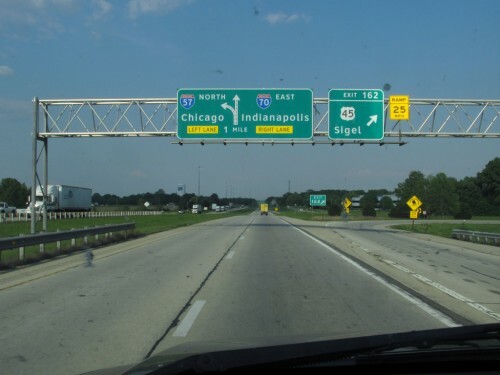 It’s like an extended remix of eastern Kansas and there’s no rat’s nest of under-construction tollways to navigate. And it’s looking like I’ll be able to finish the trip without having paid a single toll. Missouri’s a pretty state to look at from the freeway.. Except that I-70 from Kansas City to St. Louis is choked with semi-trucks. They dissipate once you hit St. Lou, but till then, man! And now there are only 7 1/2 more driving hours till I reach the job site. Hopefully I can get water, power, and gas activated on Friday. I’ve lost my sunflower seed inner-cheek callous. There will be a few more days of pain as the tissues rebuild. Got on the road before 6 this morning. If you want to know what a place looks like *right before* it turns into a ghost town, I recommend taking a drive down Main Street in Tucumcari, N.M. When you put a lot of cattle together in one place, it doesn’t smell very good. One day I will write a critique of American drivers. It will be entitled Brave Enough to Tailgate, Too Scared to Pass. There will be at least one chapter dedicated to Arizona. Mileage: 15, 19 (!). The 15 was driving primarily uphill and the 19 primarily downhill. But still. My truck seems to appreciate being given a real truck job to do. It handles the trailer like a champ. Bought gas in Gallup and Santa Rosa. Having now been to Dodge City, I realize I may not have given Deadwood enough credit. I’m surprised by how much of Mexico currently resides in southwestern Kansas. Dodge City’s Boot Hill, aka the parking lot next to Applebee’s. 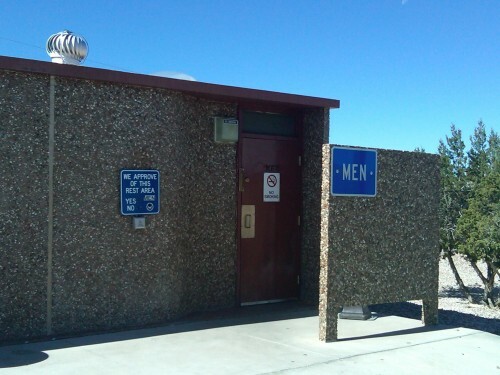 We refers to “men”, I imagine. I didn’t vote. It looked like there were germs on the buttons. Gas Mileage: 16 (!) — kind of ridiculous. It’s the same mileage I got on the cross-country road trip, only this time I got the bed of the truck full to the gills and am pulling 2,000 lbs. worth of crap in a U-Haul trailer that’s older than I am. Next time I take a 22,000-mile road trip, I gotta make sure the tires are inflated I guess. Best Song: Johnny Cash’s “Man In Black” seemed really good when it came on. I think Johnny Cash probably just sounds good on road trips though. Best Thing Consumed: The Del Taco in Yuma was a little disappointing, but then the Indian reservation convenience store in Mesa had Code Red on tap and, man, I’d forgotten how good fountain Code Red was. Also sort of what my brother’s driveway looks like. Next Up! : I dunno. I was thinking of taking up Tennis Lessons perhaps. I’m thinking I’ll go ahead and add an hour to the trip (taking it from 38 hours driving to 39) and head up into Kansas instead of running through Amarillo and Oklahoma-OK again. Haven’t driven through much of Kansas (I’m sure it’s fascinating). Maybe Salina tomorrow night? Couldn’t find any blown fuses this morning that would explain why the running lights on the trailer don’t work, so I’m trying not to drive in the dark, which is kind of constraining. And I might change my mind in the morning and just try to make it to OKC. Mal sehen. Was reading Angle of Repose when I was in Pittsburgh a few weeks ago (the house-hunting trip) and realized where/when I’d last read it: when I was moving to NYC back in 2005. I remember sitting in the airport in Cincinnati (where I was making a connection on Delta) reading it and thinking it was particularly odd to be getting so wrapped up in The West while abandoning it for the most East Coast of east coast cities. It also struck me as probably a really bad way to begin the NYC adventure — by longing for the wild, open spaces of the west. Pittsburgh is not New York City. 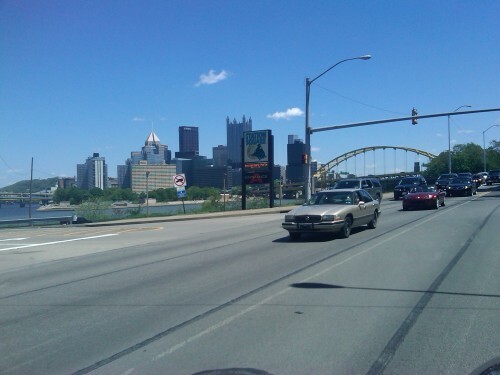 You can drive in Pittsburgh. There are grocery stores with parking lots. Stuff is CHEAP. I’m going to be living in a house with a yard and a garage. I’ll be working with a group of people and I’ve already met some that are cool while at the same time not manic-depressive. Pittsburgh is sort-of the West. Definitely through the Angle of Repose lens Pittsburgh would have been considered more like the wilderness that it would have been like the civilization of New York. And it’s sort of a frontier town anyway. Once you get out of downtown and Oakland, Pittsburgh starts looking and feeling like the capital of Appalachia, more like a part of West Virginia than part of the same state that includes Philadelphia. The west isn’t The West. Maybe there are parts of Montana and Nevada that shouldn’t be painted with this gloss, but the modern-day west has nothing to do with the frontiers and taming-the-wilderness values and lifestyle of Angle of Repose. 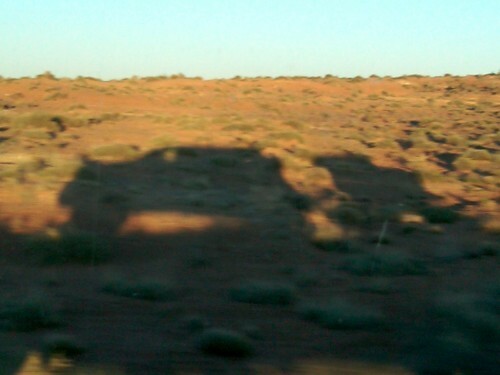 That’s one of the things the road trip taught me — the romantic West is pretty dead. In fact, it seemed more controlled and less “rugged individualist” than a lot of other parts of the country. Wyoming had the most offensive, threatening road signs in the country (e.g., “if you don’t wear your seatbelt, we’ll find you and it will cost you”-type messages) and most of the west was similar. Granted, I tend to perceive the world almost exclusively through a windshield, which might not always be an accurate reflection of reality, but still — driving in Michigan, for example, felt considerably more free. And after you’ve been on the trail to Half Dome for an hour and a half, you realize that the freedom and solitude and therefore to a large extent the bigness of the western wilderness is likewise little more than a matter of legend. So basically, I think Pittsburgh will be much better than New York. And I don’t think it fits my ideal place to live, but after that road trip, I don’t know that a close approximation of my ideal exists anyway. Oh well. And I still think that the book ends too quickly and/or that the author should have spent a little more time on the framing story to better justify its existence. And it’s still one of my top five books of all time.